After a gimmicky start with his cannibal western Bone Tomahawk, writer-director S Craig Zahler found his style with the extreme barbarism of Brawl in Cell Block 99. His distinctive fusion of deadpan humour, nihilism and extreme violence makes for an ideal match-up with Mel Gibson, a star aiming to extend a career sputtering from various controversies. Both men emerge stronger for their collaboration on epic thriller Dragged Across Concrete, even if any snowflakes in the audience might well feel like victims of GBH. The story kicks off with Henry Johns (Tory Kittles), an ex-con who returns home to his heroin-addicted mother and teenage brother. Johns takes on a criminal job which brings him into conflict with disgraced law enforcers Brett Ridgeman (Gibson) and Anthony Lurasetti (Vince Vaughn), who are on hiatus after being filmed assaulting a drug-dealer. Ridgeman has family problems of his own, and hopes to line his pockets by shaking down some local crooks. Unfortunately for the off-duty cops, the bank-robbers they target are well organised and armed to the teeth, leading to an extended and bloody conflict. 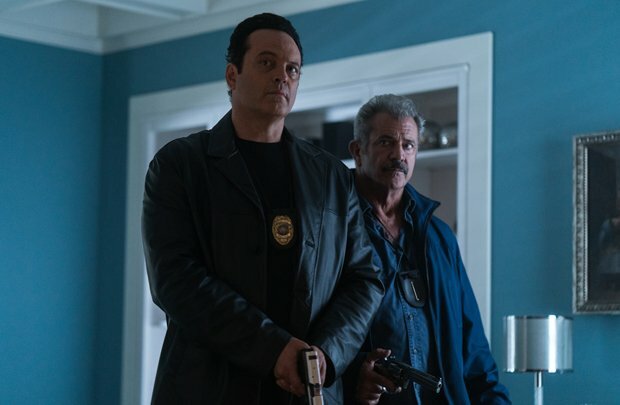 Zahler never saw an exploding cranium he didn't like and Dragged Across Concrete's protracted 159-minute running time features several gory diversions which feel like rambling self-indulgence, notably a melodramatic aside with Jennifer Carpenter that slows the narrative and has no point other than shock value. It's a shame because Gibson pulls off his best work in decades as he doubles down on world-weary charm, and there are highly enjoyable one-scene cameos from Udo Kier and Don Johnson. Zahler has a cult following, and deservedly so; his films certainly stand out from the crowd. He's on course to make a stone-cold classic in the Don Siegel mode, but the patchy yet compelling Dragged Across Concrete will do for now. Screened on Fri 22 and Sat 23 Feb as part of the Glasgow Film Festival 2019. General release from Fri 19 Apr.